A top round roast is the perfect comfort food. Making one, however, can be a big time commitment. It takes about 4 1/2 hours to bake a roast in the oven and ten hours to cook one in a slow cooker. 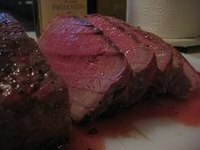 If you feel like a roast but don't have time to prepare it, consider using a pressure cooker. A pressure cooker is a convenient way to cook a top round roast in about an hour. Trim the excess fat from the top round. Mix the seasoned salt, salt, pepper and paprika in a small bowl. Rub the spice mixture into all surfaces of the top round. Place the top round, onions, garlic and stock into the pressure cooker. Secure the lid on the cooker. Cook the top round for one hour under 15 pounds of pressure. Reduce the pressure at the end of the hour and open the lid. Test the meat with a thermometer to make sure it is at 140 degrees. If needed, replace the lid and cook for another 10 minutes. A top round is cut from the top round muscle and is one of the most flavorful cuts of meat. Cook only to medium rare and cut into thin slices. Cooking top round using a dry heat method can make the meat too chewy.